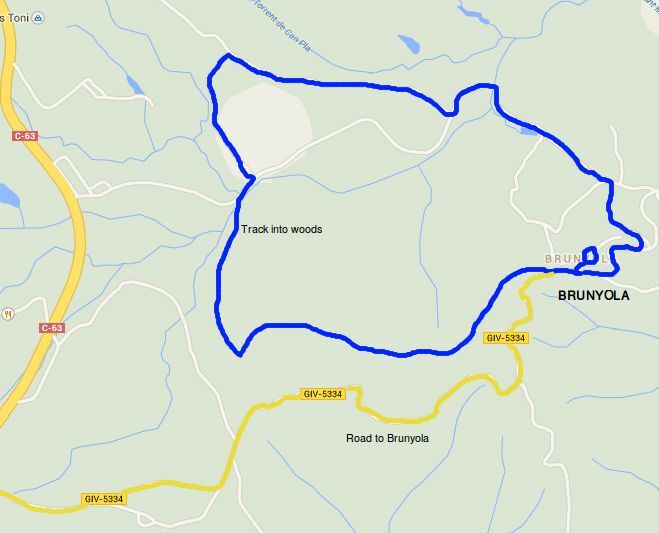 As we had to be at Girona Airport at the weekend, we looked for a walk nearby and found the village of Brunyola just off the main road to Vic. Brunyola is a tiny hamlet sitting on top of an isolated hill with views all around; south to Montseny, out towards Cassa de la Selva and the Gavarres to the east, and of course views to the hinterland of Girona and the Pyrenees. The village itself is barely more than 30 houses, but has a castle, church, restaurant and children's colonies auberge and for time we were there, it seems quite a number of visitors who had come in for Sunday lunch. Access to the village is pretty much one road in and one road out so you have to come from the west off the C-63 road. Driving into the centre the few streets that are below the church are full of cars with visitors who have come for the local restaurants. So we park just around the corner on a patch of rough ground that looks out towards the airport plain. 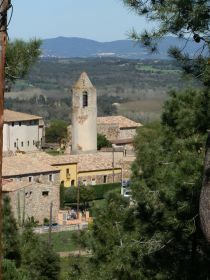 The village stands above the plain for the airport and we can look out towards Girona in one direction, or turn and look towards the mountains in other directions. We firstly walk up to the church and then around the corner to the conjoined castle which looks more like a private house now. The hamlet only consists of 3 or 4 streets so there is not too much to see, so from the castle street we continue past a row of new houses and into the woods at the end. We could take a small windy road down off the hill, but we cut into the woods and track the road through the woods working our way down the hill before re-emerging by the small road at the bottom. We follow the road around the bottom of the hill by fields full of crops bursting into growth in the warm spring sun - certainly warm enough that we don't need to wear jumpers or coats. 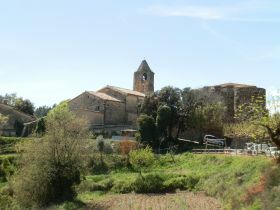 The road itself is very quiet, really just connecting a few farms and the hamlet and is marked as part of a longer footpath from Sant Colomers de Farners to Angles. It's pleasant good walking countryside in among hills, but without being spectacular. The marked footpath leaves the road and takes a track past two expansive masia and we could continue, but as we want to make a round trip, we take a left down the track back towards Brunyola's hill. At the end of the track we are back on the road, but this time we practically just cross over and go back into the woods across a small stream and follow the path as it snakes around the bottom of the hill. We're looking to climb the hill and for a while it looks as if there is no path up, but as we're approaching another farm by an olive grove, we see a switchback to our left that takes us up the hill. As the path climbs, the views get better, but we're starting to feel the heat from the sun now so we're perspiring as we get towards the top. There's a viewpoint right at the peak, but we cut around the edge and follow the path along the top of the hill as it slowly descends to Brunyola. As we get back, the colonies house seems full of families after their lunch with children playing in the playground.